Register by March 8th for the Best Rate! 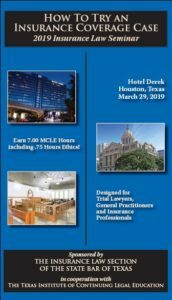 One-day CLE seminar “How to Try an Insurance Coverage Case” will take place at the Derek Hotel in Houston, Texas, on March 29, 2019. Click here for secure online registration via the Texas Institute of CLE website. Earn up to 7.0 hours MCLE credit, including .75 hours ethics! A limited number of rooms have been reserved at the special rate of $135.00 per night plus taxes for a single/double. Hotel Derek is located at 2525 West Loop South, Houston, TX 77027. The hotel deadline is March 7, 2019 or until the room block is exhausted, whichever comes first. Please call the hotel directly at (866) 292-4100 or (713) 961-3000 and request the “Texas Institute of Continuing Legal Education” group rate. We recommend that you make your hotel reservation immediately if you plan to attend this course.